Several major UK charities now found themselves being in the unfortunate position of being less ethical organisations than corporate bastards Tesco due to their continued participation in the government’s workfare schemes. Hot on the heels of Tesco announcing they “will not be taking part in any mandatory (workfare) scheme set by the Government”, Oxfam and Marie Curie have also said they will no longer use workfare workers. Housing charity Shelter confirmed that they stopped using the scheme last year after concerns that it was not in the interests of potential volunteers. However several major UK charities, including Age UK, Cancer Research, the British Heart Foundation (BHF), Barnados and the PDSA have so far remained quiet on their use of forced labour. Chef Executive of the BHF, Peter Hollins, earned a whopping £153,000 in 2008, and the average salary of the top 100 charities Chef Execs is now over £166,000. These vast sums don’t appear to have trickled down though and the chances are that the person serving you in a British Heart Foundation shop is a workfare slave, paid nothing other than the pittance available on Job Seekers Allowance. Charities have always used volunteers, and no-one has objected to that. What the hundreds, if not thousands of people, who have contacted Tesco this work are concerned about is the punitive measures now being used to recruit these so called ‘volunteers’. Workfare staff, as well as being unpaid, have no workplace rights. If they are dismissed for any reason they face having their benefits sanctioned, leaving them destitute and possibly homeless. Increasingly people who are sick and disabled are being bullied onto workfare schemes, and plans revealed in the Guardian show that they could be forced into permanent unpaid positions with charities and businesses alike. Many workfare workers have complained of no longer having the time to look for paid work properly due to workfare schemes. Some, like Cait Reilly, who is currently taking legal action after being forced to work in Poundland, were already volunteering and on the way to gaining a career. Benefit levels are so low that many workfare staff go without lunch. This isn’t a few hours a week doing good deeds or helping organise a local church fete. Charities are using workfare staff full time, in what were often previously paid positions. As many charities now have gained contracts to carry out public services, something Cameron claims to want more of, then this could depress wages across the public sector. And whilst charities are feeling the pinch just as much as every else, with Chief Execs living lives of luxury, then any justification charities need to use slave labour to survive ring somewhat hollow. Unfortunately, for some charities, their involvement with this scheme goes even deeper than merely exploiting workfare staff. Over 300 voluntary organisations have been listed as sub-contracters to administer the government’s Work Programme scheme including household names such as Mencap and the Prince’s Trust. Many of them, some who already use workfare staff themselves, will be some of the key organisations responsible for helping to implement the scheme. In other words they may be directly responsible for pushing vulnerable people into workfare whilst the DWP hovers in the background threatening benefit sanctions for non-compliance. Under Work Programme claimants can be forced to work 30 hours a week with no pay for up to six months, something far more draconian than the Tesco workfare position which caused public outrage. Astonishingly these charities have signed contracts which gag them from even being critical of the DWP and the workfare scheme. So far it hasn’t quite been plain sailing however and many charities are already raising concerns that workfare isn’t turning out to be quite the gravy train they hoped for. That charities should be quite happy to be actively involved in press-ganging vulnerable people into forced labour, and only really raise concerns that they aren’t making enough money out of it, reveals an astonishing gulf between charity bosses and the people they claim to be there to help. At the forefront of this has been the Disability Works Consortium, an alliance of charities working together to maximise income from workfare, and which includes MIND, SCOPE (who’s shops are riddled with workfare staff), The Leonard Chesire Foundation, Action for Blind People and Mencap. It’s not that these organisations have been unaware of the problems of the workfare schemes and the distress they have brought to some people’s live. Disabled People’s Organisations, claimants groups, and perhaps most importantly their own users, have told them time and time again that workfare is exploitative, demeaning and damaging to wages and conditions for everyone. But these charities have chosen not to listen, instead jumping through ever more complex moral and intellectual hoops in order to justify the hundreds of thousands of pounds they’ve been raking in. Just like free market ideologues and bankers, charities have taken the position that what ever makes them the most cash just happens to also be the morally correct thing to do. 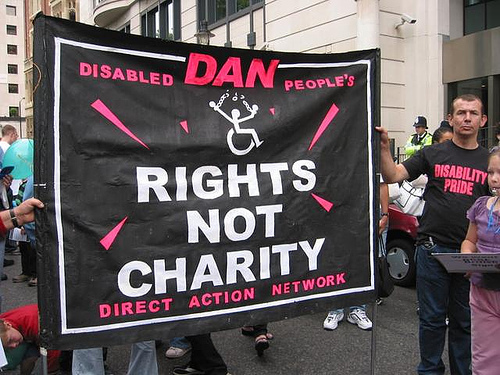 Everyone agrees that disabled people should have the right to work, and access to support and training. No-one disputes that for young people volunteering can be a way to gain valuable experience. The problem is that consent has been removed from the system and the threat of starvation and homelessness has been used to bully people into unpaid labour. It’s really not a difficult concept and now the public have been made fully aware of what’s going on they have rightly shown their contempt for the whole shoddy operation. Participating charities should hang their heads in shame for colluding in (and profiting from) this abuse of the most vulnerable in society. The road the charities have taken has given soft cover to some of the most brutal welfare policies in the Western world. Policies that have failed everywhere they have been implemented. Policies which are now leading to a situation where someone with terminal cancer could be forced to work night-shifts stacking shelves at Tesco, or day shifts stacking shelves in a charity shop, all for no pay. These charities are just as vulnerable to commercial pressures as the likes of Tesco, Matalan, Sainsbury’s and TK Maxx who have all now pulled out of mandatory workfare. A threat to withdraw donations and boycott the shops of MIND (@mindcharity), SCOPE (@scope), and Mencap (@mencap_charity) may well help focus their minds. As resistance to workfare spreads, not for the first time, the likes of SCOPE could see angry mobs of disabled people and claimants outside their shops and offices. It’s time they pull out of these schemes completely, tear up the contracts and issue a clear condemnation of any scheme that uses threats of benefit sanctions to force people to work for no pay. The collapse of workfare is near complete as the corporate sector runs for the hills in the face of public fury. All that’s left propping it up now is these charities, who depend so much on the support of the public for their very existence. We should not be squeamish in holding them to account for their actions every bit as fiercely as we have done to the likes of Tesco and Poundland.